I'm sure you've been asking yourself, "When is Hub going to show me how to take a picture of two basketballs at rest on a stone wall?" Well, today's your lucky day. 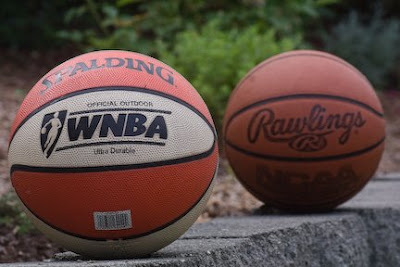 These two basketballs were shot using a 52mm (normal) lens. 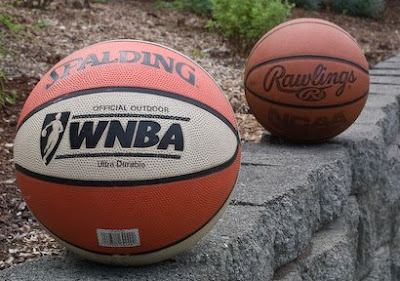 To maintain my position of neutrality in the industry, I have intentionally selected a Spalding and a Rawlings basketball for this exercise in optical illusion. 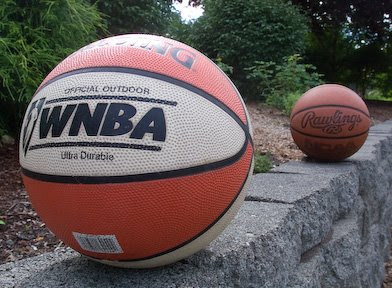 Actually I'm using these two basketballs to illustrate a photographic lens phenomenon associated with focal length - distance distortion. The picture above was taken with my Canon DSLR's normal lens (52mm focal length). Notice the distance between the two balls. This distance was approximately what I saw with my own eye. This picture was taken with a 300mm telephoto lens. I changed to a 300mm lens for this picture and moved my camera back until the first basketball appeared about the same size as it did in the first picture. I did NOT move the basketballs. Notice in this picture that the two balls "appear" to be much closer together. The rule is: the longer the focal length of a lens, the more it will compress the apparent distance between objects. This picture was taken with a 17mm wide angle lens. Again I changed lenses. In this case, I chose a 17mm wide angle lens. I moved the camera close enough to the first basketball to make it approximately the same size as the first picture. Now the distance between the two balls has "apparently" increased. However, I did NOT move the basketballs. The rule is: As the focal length of a lens decreases the apparent distance between objects increases. The actual physical distance between these basketballs remained constant for all three pictures. You see this optical phenomenon all the time on televised NASCAR or Indy races. The cars look as though they are stacked bumper-to-bumper from the head-on shot down the straight away (using a very long telephoto lens), but the side shot of the entire field reveals that the cars are 100 feet or more apart (using a wider angle lens). Let me know if you have any questions or comments. You know where to find me.